A “passport case” is a necessary item that protects your passport. Products with anti-skimming features are now increasing, making it an item that is indispensable during trips. There are products from famous fashionable products made from leather, or those you can hang on your neck, and many other variations of passport cases. It can be a little confusing to choose once you have decided your purchase. So we will introduce passport cases available online, and show you the top items in rank order. Hope you can find the item that is perfect for your travel style. Passport cases are as the name says it, a case for your passport. There may be some of you who are thinking “is it really necessary?”. You should always be alert and aware of pickpockets and snatchers, especially in a foreign land where you might be too busy looking around. It doesn’t really matter which country you choose as your destination, as long as you are a “tourist” you may become a target. Passports have a higher possibility of getting stolen. Passport is your identification in foreign countries, so it is a huge hassle if you lose it. You also need to use the same passport for at least years, so you should be very careful not to wet it, and keep it clean as much as possible. With these said, it is best to purchase a passport case before your travel plans. There are so many passports available on the market, from a variety of brands, making it really confusing to choose one at first. We will now introduce the important points you should be checking before your purchase. Make sure to check these before you buy your own case! There are passport cases that can store travel necessities other than your passport, which is called a travel organizer. If you are buying this type of passport case, do not forget to check the storage capabilities. You can also check first the cards and small items you need to bring on your trip. For example, you will be traveling to a place with a language you are not familiar with, then you can put here you phrase list, or vocabulary list. You will also need to fill in documents inside the plane before arriving at your destination, so keeping a pen inside will also be a good idea. You should check your travel style and decide whether you need a simple cover type or an organizer type with many features. If you are going to choose the organizer type, try to compare their features. There are a lot of passport cases that can help during travels with different features. Try to enjoy looking at the different features! There are passport cases that prioritize its wallet function, making sure the different currencies do not get mixed up. There are also cases that are designed for smartphone users, in which you can store your phone and earphones. Try checking out these features if you need them! One of the most important features of a passport case is its safety measures and anti-crime features. If you are someone who prioritizes these features, then these are the 2 specific functions you should look for in a passport case. The first function is whether it is pickpocket/ snatcher proof. As mentioned before, for some countries even walking during daytime can be dangerous. There are passport cases with chains to prevent being stolen by pickpockets, or those you can wrap around your belly that are called security pouches or secret pouches, and those you can hang around your neck. The second function is skimming prevention. Skimming is a crime wherein the IC chip inside cash cards and passports are being scanned, and all the information is used to create a copy. There are passport cases with features to prevent skimming, so try checking them out. Of course, storage and anti-crime features are important, but you shouldn’t put designs aside. Choosing something that you really like, and something that fits your travel style is also important. It will make your travel even more enjoyable. If you travel to places that are known to be unsafe, then a passport case that is expensive-looking may not be a good idea, as it may become a target for snatchers. Choose a design that suits your travel destination. We will now introduce the top 7 most recommended items in the Philippines. Make sure you choose the one that is perfect for you. The design is very classy, it has a world map print embedded with the words, “world trip” in the center. Its cute design will match perfectly with your travel outfits and most definitely Instagram worthy! It has a rubber band to keep the insides from falling out. This passport cover is not only waterproof but also dustproof and soil resistant. Although it doesn’t have a card slot inside, if you prefer a slim case, this will be your best travel partner. This passport case has 4 card slots and 2 pockets for passport, tickets and boarding pass. You can also keep your pen for writing an arrival card. All you need during your flight all in one place. It has one snap closure to secure your valuables from falling. 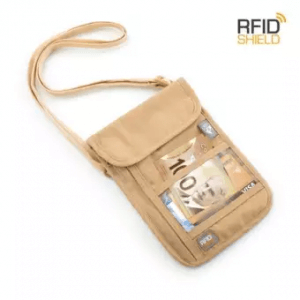 This also comes with RFID blocking shield to prevent your passport and cards from being scanned. It is recommended for all person who often takes planes because of its amazing capacity and slim size. Unique and Fashionable Design for Your Artistic Side! The usual passport cases we usually see have plain designs, which can get a bit boring, but not this one. It has a very unique and artistic design and even has a credit card pocket inside. There is not much storage though, just enough to keep your passport stylish and protected with RFID blocking feature. If you want to distinguish yourself from others, this is a perfect choice for you. There are a lot of different designs from this seller, but this one is our personal favorite! Check out their other designs too! Enjoy Highly Organized Trip with This Case! 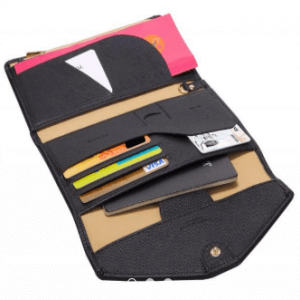 This passport case is made of waterproof wear-resistant nylon material. Even if you spill your drink in the bag, this case will protect your valuables. It also comes with a strap to prevent it from getting lost. It has enough storage to keep your phones along with your passport, and can also serve as a pouch. This comes in different colors too, try checking all of them out. This passport case is very stylish – stylish enough you can bring it around just like a pouch. There are a lot of pockets to keep your belongings organized not only during your flight but also all throughout your trip. There is even a pocket where you can put the local currency of your destination, and a pen holder for your convenience. This item comes with a lot of color variations and 2 sizes. It is recommended for families since you can buy one for each member of the family. It can be a huge help if you can use both your hands during travel. Also, hanging them on your neck will prevent pick-pockets too. If you want to enjoy your trip without worry, take this with you. This also comes with RFID blocking shield. It has a huge storage, but it comes in a flat design, so you can keep it under your cloth comfortably. If you have a plan to travel to an unsafe area, this will surely help your safe trip. We have introduced the top 7 passport designs, how was it? Passport cases have a lot of variations and features, but we chose the top items. Passport case is a very important item for your security during your international travel, and for keeping your passport that you’ll be using for years. Use these pointers as a tip and find the perfect passport case for you!